If only the original Korg M1 had included this Easy page to control its envelopes and parameters! As a Wavestation SR user, I was excited when Korg released their software version in the original Legacy Collection, but I always viewed the MS20 and Polysix emulations in the bundle as odd bedfellows. The Wavestation is renowned for its slowly evolving timbres and its strings of rapidly changing wave-sequenced tones, while the other two synths and the mini MS20 controller were unquestionably aimed at analogue fans. Many other Wavestation enthusiasts seemed to agree, so there was renewed excitement when Korg recently announced the Legacy Collection Digital Edition. 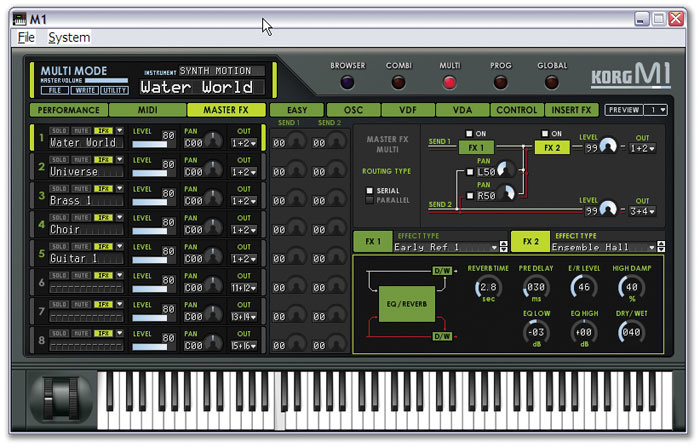 This once again includes the Wavestation emulation (now up to v1.5), but this time it's partnered with a software emulation of Korg's M1 workstation. This makes far more sense to me, as the M1 is probably the most famous and best-selling digital workstation of all time. Even people who still have Wavestations and M1s have an incentive to buy the Digital Edition, since it includes the sample and patch collections that were originally only available on expensive ROM/PCM cards. By my reckoning, the cards in this bundle would have cost over £1000 at their original prices. Both synths in the Legacy Digital Edition can be run as stand-alone applications or as VST, AU, or RTAS Instruments, and the bundle is completed by the MDE X multi-effects plug-in of the previous collection, which has also been upgraded to version 1.2 by the addition of RTAS support. On Macs, OS 10.2.8 or later is required to run Legacy Digital Edition, along with a minimum of a G4 500MHz machine with 256MB of RAM, while PC owners will need at least Windows XP, a Pentium III 1GHz processor, and 256MB of RAM. These are modest requirements, but borne out by my tests — 64 notes played on Legacy M1 typically required just 25 percent of my Pentium 4 2.8GHz PC's CPU power. The original Korg Legacy Collection used challenge/response protection, but Korg, like Steinberg and Arturia, have switched to using a Syncrosoft USB dongle. I'm certainly happier with this form of protection, since you never have to reauthorise a dongle after changing your computer or hard drive. You don't have to worry about possible dongle conflicts if you already have one or more Syncrosoft dongles installed either, since Syncrosoft's Licence Control Centre software supports multiple dongles from different manufacturers. If you're already using a Syncrosoft dongle, another option is to add the licence for the Digital Edition into it, rather than into the new dongle provided by Korg, so that you're not tying up your USB ports with unnecessary devices. I checked with both Korg and Steinberg to see how they felt about one of their dongles being used to store the licence relating to another company's product, and they confirmed that there's no technical reason why it can't be done, but did point out the complications that might ensue if the dongle was lost or stolen. In the end, I had insufficient space on my existing dongle to license the Digital Edition anyway, so I plugged both dongles into a USB hub, registered the Digital Edition on the www.korguser.net web site, got my Activation code, and then used it to license the Korg dongle. So far, so good. 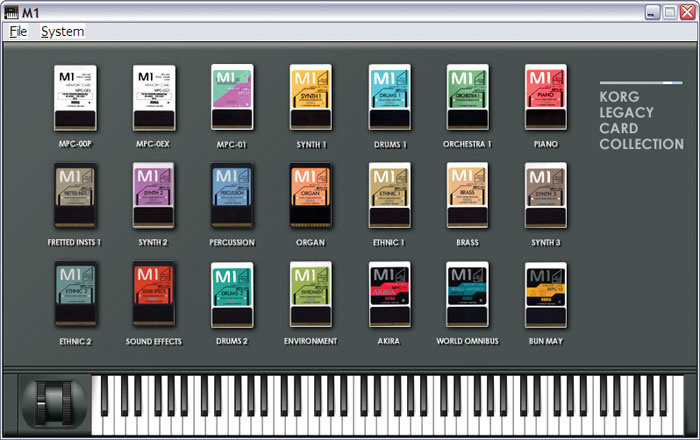 I suspect that only a few musicians have ever had access to this complete collection of sample/preset cards, but they are all bundled with the software M1 — an absolute bargain.The contents of the 19 expansion cards originally sold as optional extras for the M1 (shown right) are instantly available in the software version via a mouse click. Most were originally sold as a pair of plug-in hardware cards — one for the PCM (sample) data, plus a ROM card holding various amounts of Program/Combi data. There's also a new KLC (Korg Legacy Collection) 'card' that showcases the new features, and incorporates 15 new sets of drum-kit samples, with genres from orchestral to trance, house, drum & bass, and hip-hop. Many SOS readers won't need me to describe the M1 'sample and synthesis' instrument, but for those who weren't around when it was first released in 1988, here's a quick summary. M1 Programs (patches) feature either one oscillator, filter, and an amplifier chain (in Single mode), two in parallel (Double Mode), or a drum map, filter, and amplifier chain. Up to eight Programs can be combined into a Combi, layered, split across the keyboard or at a certain MIDI velocity, or used as a Multi, with each Program on a different MIDI channel. Two effects blocks were also included at the end of each chain to provide a 'finished' sheen to your Programs. But it was the sounds themselves that caused a stir. There were 16-bit samples from a variety of acoustic instruments, a set of short sampled attack portions, digital waveforms, and of course that famous hard acoustic piano, which proved ideal for cutting through dense rock and dance mixes. Astoundingly by today's standards, these sounds filled just 4MB. All these sounds are available on Legacy M1, plus the original 100 factory Programs and Combis, and the samples, Programs, and Combis from the M1EX internal expansion. The real bonus, though, is the inclusion of the contents of all 19 of Korg's original ROM/PCM cards (see the box below). Not all the content is recycled; Korg have added a preset bank to showcase the extra features unique to this Legacy recreation. There's a resonant filter (how hard we programmers tried to work around the lack of one on the original M1), an extra LFO for amp modulation, and a new compressor, plus many extra effects. While the original M1's Programs sounded rich due to their two effects blocks, when you switched into Combi mode these two blocks became Master effects assigned to all Programs, so the individual sounds lost a lot of their character. On the Legacy M1, when you switch to Combi mode the two Master effects are available as before, but you can also optionally retain the two Insert effects of the individual Programs (so up to 16 supplementary effect blocks are available). For more control, there's also a new Multi mode that offers full eight-part multitimbral operation with up to eight separate stereo outputs, with individual effect sends from each Program to the Master effects. Although there is still a maximum of eight multitimbral parts, it almost goes without saying that with Legacy M1, limited polyphony is no longer a problem (the M1's 16-note polyphony dropped to eight in Double Mode, and even lower in many Combis). The Global settings now include user-selectable polyphony values of eight, 16, 32, 64, 128, or 256 notes to suit your needs. I always found the M1's interface fairly straightforward, but as you can see, the virtual version's is a dream by comparison, with graphical displays of filter responses and envelope shapes, plus draggable rotary controls to replace the bland parameter readout and Up/Down buttons of the original. The new Multi mode is a supercharged multitimbral Combi with up to eight Programs (each with two Insert effects), assignable to a maximum of eight MIDI channels and eight stereo outputs.Most people will start by selecting one of the five Select buttons across the top of the interface: Browser, Combi, Multi, Prog, or Global. 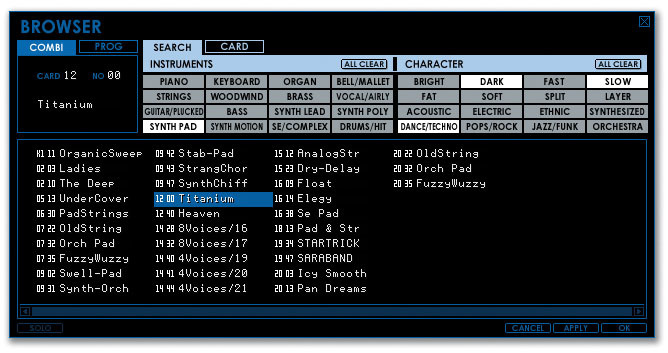 Clicking on the Global buttons produces a screen with three sections devoted to MIDI settings, keyboard and scale tuning, and system settings such as polyphony, output gain, and number of stereo outputs. In Prog mode, you can access six of the row of nine 'Page Select' tabs that appear across the top of the main interface. These let you explore the various controls for the Oscillator, VDF (filter), and VDA (amplifier). The Control tab lets you map aftertouch and an external MIDI controller to various parameters, and under Insert Effects, you can choose and program one or both of the two effect blocks from the 34 available. The sixth tab is a new Easy page with a subset of the most useful parameters from each of the other pages, and in the case of Double programs both sets of filter responses, envelopes, and amp envelopes are displayed here graphically superimposed — you can either select them individually or use the Link Edit button to drag and edit them together. The left side of the interface displays a Performance area where you can globally tweak various aspects of the Program, such as output level, pan, filter frequency, and attack, decay, and release times. These edits are normally lost unless you specifically save them to another Program slot. Switching to Combi mode, the Performance area disappears, and in its place are the level, pan, and output-channel settings for the maximum of eight Programs that can be associated with the Combi. However, one huge improvement is that the Combis don't just store the Program numbers associated with them — they also let you directly edit the Programs, so you don't have to keep jumping back and forth between Prog and Combi mode when editing the Combi. The Browser provides a quick and versatile way to find the sound you need from the 2700 supplied, using Instrument and Character choices such as those shown at the top of the window.In Combi mode three additional Page Select tabs are enabled: Performance, MIDI, and Master Effects. Performance lets you tweak the same list of Program parameters as in Program mode, but this time they're shown on the right side of the interface as a table displaying all eight sets of parameter values (one for each Program). 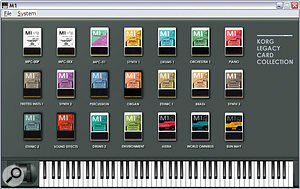 The MIDI page lets you adjust the MIDI channels, key zones, velocity zones, transpose, detune, and various MIDI filters for each Program in the Combi, so you can split sounds across the keyboard, switch between them as you play louder and softer, have some but not others respond to aftertouch, and so on. These controls largely explain why the Korg M1 can have such a 'full' sound. The Master Effects page in Combi mode is essentially identical to the Insert Effects page of Prog mode, and on the original M1, this was all you got — two effects to be shared by the eight Programs. This time around, each of these eight possible timbres has a tiny button labelled IFX that lets you reinstate the two effects blocks already associated with each Program, albeit at the expense of some CPU overhead. Multi mode is almost identical to Combi mode, except that by default each of the eight possible timbre slots is routed to a different stereo output (from 1/2 through to 15/16) for multitimbral use, and this time all the IFX buttons are enabled by default to retain their Program effects. Essentially Multi mode makes it quicker and easier to assemble Programs for multitimbral use. The final Mode Select button is Browser, and this makes choosing suitable sounds for your songs much easier than on the original M1. With over 2700 sounds available in this version, this is just as well! The Browser functions in Prog and Multi mode, letting you audition individual Programs, while in Combi mode you can either select individual Programs to be pasted into the timbre slot of the current Combi, or complete Combis. You can browse by the contents of each Card (handy if you're familiar with their contents), or use the Search button to look directly across all cards for instruments of 16 different categories, including piano, organ, strings, woodwind, brass, vocal, guitar, bass, synth lead, synth pad, and drums. Multiple choices are accepted, and you can further refine your choice using the 16 Character buttons, which encompass such aspects as bright or dark, fast or slow, and fat or soft! Once again, multiple choices are possible. Once you've selected a sound in Card mode you can also switch to Search mode and all sounds with the same search instrument and character settings will appear, so you can hone your choice. The browser can also be used to choose the basic Multisounds used in each Single and Double Program, and even the kit used in a Drum program. 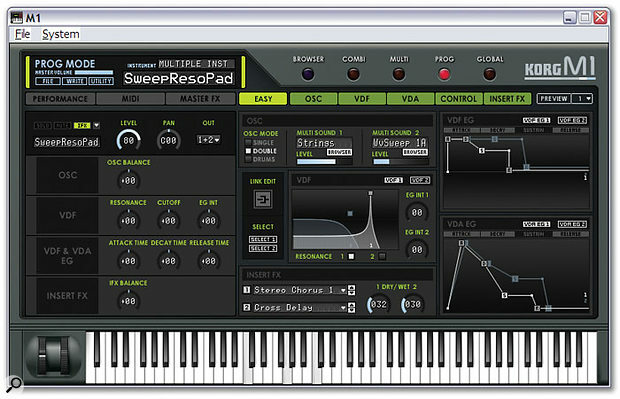 You can audition each sound using your MIDI keyboard or the on-screen one, and either hear it in context with the oscillator, filter, and amplifier settings in place (and the other Programs in the case of a Combi or Multi), or click on the Solo button it to hear the Multisound in its raw state, or the selected Program by itself. There's also a handy Preview button that helps when browsing by continuously playing one of six preset phrases. My only regret is that you can't assign instrument/character tags to the sounds of imported User banks, to include them in your subsequent searches. 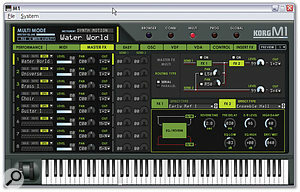 The main improvement to Legacy Wavestation in the Digital Edition is that in addition to the three RAM banks and eight ROM banks of the Wavestation SR model, Legacy Wavestation v1.5 includes the contents of the six optional Wavestation cards, which are now very difficult to get hold of in their hardware form (particularly the Synth/Timeslice one). Each provides an additional 50 Performances, plus associated patches and wave sequences, giving a grand total of around 1400 presets and sounds, and more than 700 sampled waveforms. The Preferences panel of the stand-alone PC version lets you choose MME, DirectSound, or ASIO drivers (or Core Audio on Macs) and up to three MIDI input devices, so I was soon happily comparing the sounds of the Legacy M1 with those of my original keyboard. Individual Programs and Banks (all Programs, Combis, and drum kits) can be loaded and saved in FXP/FXB format, but the dedicated File button also lets you load and save individual Combis and Multis, and import MIDI SysEx dumps of All Data, All Combis, All Programs, or a single Combi or Program from existing M1 libraries. I had no problems importing any of the M1 SysEx dumps I've collected and programmed over the years, and I was pleased to find that everything sounded almost identical to before. The only difference was that everything sounded cleaner, with less background noise, presumably because I was listening via a modern interface, and not through 18-year-old A-D converters. The new resonant filter sounded lovely and adds lots more versatility to the synth, as do the new effects options, although to my ears the effects output levels did seem to be globally slightly higher in the mix, and on most Programs and Combis I had to reduce the reverb level from around 18 down to 13 for a better match with the old hardware (this was particularly noticeable with drums). If you want to revisit old M1 songs, your mixes won't sound quite the same until you perform this tweak. I did find it slightly frustrating that once you'd selected a sound in the Browser and returned to one of the other edit pages, the card and number of your choice wasn't displayed anywhere in the interface, and although clicking on the Browser button again returns you to the same card page, your most recent choice isn't still highlighted. Because of this, it was often hard to find sounds I liked for a second time. Similarly, it would be helpful in a future version if the file name of an imported User bank was displayed somewhere, to remind you which one you're auditioning several hours down the line. While the original Legacy Collection, at a UK price of £399, had no single philosophy tying it together, the Digital Edition should please digital Korg fans by restricting itself to the M1 and Wavestation, and at £119, it's superb value for money. There's some talk of reissuing the Legacy MS20 and Legacy Polysix as the Analogue Edition and dispensing with the miniature hardware controller to bring the price down to a similar level, which also makes a lot of sense. I normally qualify my recommendations in various ways, but at this price, there's nothing further to say. Unless you hate the sounds of the original M1 and Wavestation, you should snap up these emulations before Korg realise their mistake and put up the price! The Legacy M1 sounds almost identical to the original hardware version, but with less background noise. Both synths in this collection include the data from the original optional PCM/ROM cards, which cost well over £1000 on release. The M1 software features filter resonance and extra effects options not found in the original. The package is superb value for money overall. Effects levels in Legacy M1 are slightly higher than on the hardware version. Patch card/number is not displayed after sounds have been selected. No way to add Browser search tags to User bank sounds. Anyone who ever liked any of the Korg M1 or Wavestation sounds should reach for their credit cards immediately — it's as simple as that. Legacy Collection Digital Edition, £119; upgrade from original Legacy Collection, £69. Prices include VAT.